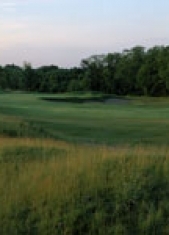 For many years, Hodge Park has served Kansas City area golfers who wish to learn how to play and those simply looking to improve their game. The 6181-yard, par 71 course located to the northeast is designed as training grounds for players wanting to improve in all areas of performance, and it’s also a fun course for a quick round of golf. Teaching the game is what Hodge’s Head Professional and Manager, Tim Underwood, loves to do most. Hodge Park also is trying to expand the golf footprint in the area. Hodge Park sees a variety of players from those just starting out in the game to those that are accomplished. 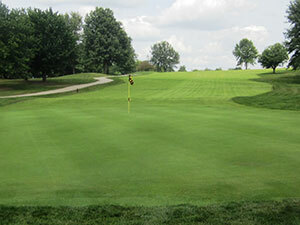 Whatever their skill level, all find Hodge Park to be a great place to enjoy a round of golf. Part of developing a solid game is learning about shot placement and Underwood believes Hodge Park does a good job of teaching players to hit with control. 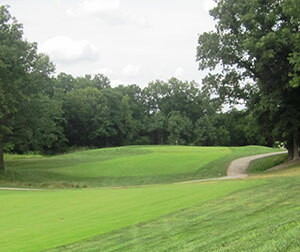 The comparison to Shoal Creek isn’t unfair, as Hodge Park is attracting more and better players, particularly since they upgraded to zoysia fairways and bent-grass greens four years ago. Course management felt it was important to upgrade the grass at Hodge Park. 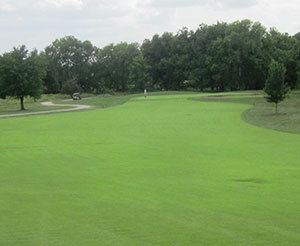 The investment in zoysia fairways has been well-received. That challenge includes the course’s most talked about hole: par 4 number 10. A downhill tee shot has to be accurately spotted at a landing zone for a reasonable second shot to the green. When players talk about problem holes at Hodge Park, it is usually number 10 they talk about. The front nine presents its own challenges. The next hole, par four, 304-yard number six, forces players to make a choice. Two dogleg par 4s, number eight to the left and number nine to the right, round out a 3126-yard, par 35 front nine which also contains one 452-yard par five and a pair of par threes. After the severe test on number 10, the 3055-yard, par 36 back nine includes two more par fives and another pair of par threes, which present their own challenges. Doglegs will again challenge players on the back nine, beginning with par 4, 388-yard number 13, a sharp dogleg right which goes uphill. One of the prettiest holes on the course is also one of the most difficult. Par 4, 338-yard number 15 requires shorter hitters to lay up in front of a pond then thread the needle between a pair of large, intimidating oak trees. Hodge Park’s frequent wildlife visitors often make an appearance here at one of its more aesthetic holes. After the longest hole on the course, par 5, 518-yard number 17, the course wraps up with one of the easiest, the 302-yard, downhill, par 4 number 18. “Hopefully you’ll end your round with a good score, making your drive home pleasant or the beer taste better,” Underwood said. Hodge Park also features many amenities to improve a player’s experience, including leagues for men, women and seniors, and special events throughout the season. A popular series of events is when they run an event associated with each major championship, pairing pro scores with amateur scores. Night golf, which the course operates three times a year is “probably the most popular event,” according to Underwood, and the turkey scramble is also very popular. 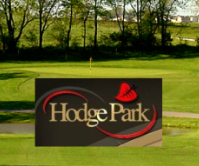 There are a lot of reasons to play at Hodge, whether you are just starting out or looking to improve your game, or want an enjoyable round of golf. The new lines of irons by some of the best known club manufacturers seem to offer the best of both worlds – playability for the average golfers and a look and feel the pleases the better players. Some of the clubs take new directions in materials while others have refined earlier designs in hopes of adding precision to every shot. We take a look at five sets of these new irons. 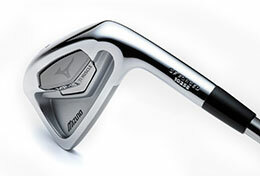 The new Mizuno MP-15 irons take a little something from their predecessors – the MP-59 and the MP-64. The clubs have the peripheral weighting of the Ti insert from the MP-59 and the profile, trajectory and feel of the MP-64. The MP-15 has the combination of carbon steel and titanium found in the MP-59, though in different volumes. The MP-59 removed 20 grams of weight and added 11 grams of titanium, but the M-15 removes 38 grams of weight, replaced by 10 grams of titanium. The clubs retain some of the compact look of the MP-64 that appeals to better players. Mizuno says the goal in making the new clubs was to refine the feel of the Ti Muscle technology without losing the extra stability it gives from off-center strikes. 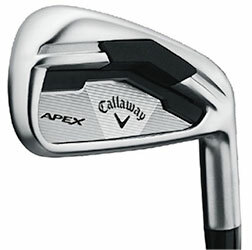 Callaway is giving a golfers a blast from the past – Apex irons, which used to be a popular line of Hogan clubs. Callaway bought Hogan some years back and eliminated the Hogan and Apex brands. The revived Apex irons are unusual for Callaway in that they are forged. The body is in soft carbon steel and the club face is of a thinner, stronger steel. The company calls the Apex a distance iron that is also forgiving. It has a low center of gravity to increase launch angles from all lies. 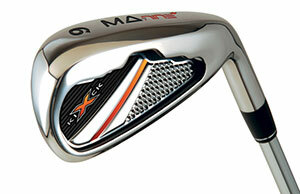 The club comes in either XP95 steel shafts or lightweight graphic shafts. 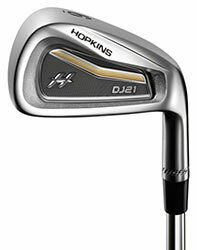 The Hopkins DJ-21 irons are all about soft feel and great control. Made from heat-treated 8620 carbon steel, the clubs have an undercut channel in the cavity and a thinner top line that suits the eye of the better player. The clubs have a satin chrome finish to cut glare. Maximum USGA dimension grooves are in every club face to improve spin rate. The clubs also have a milled pattern to bring even more spin and control. The pitching wedge, at 47 degrees, is one degree weaker than some of the more popular irons. The latest generation of the Ping G-series is the G30, an iron designed to give distance but control through a slight bending of the club face. 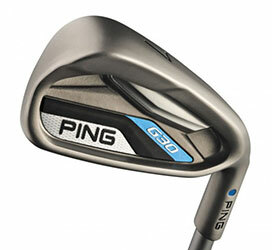 The Ping G-series has been around since 2003 and is built on foregiveness of missed shots. In the G-30, the idea is to do that with a shape that is not too unconventional. The G30 is slightly thinner than the G25, giving it extra ball speed while shifting some of the mass of the club to the low back side. The head of the G30 is traditionally large but with plenty of offset, with softer lines. The club also has a little Karsten in it, but is not quite as jumbo in design. It is crafted to give more height and stopping power to the shots. The club has some of the sole contours of the Ping i25. Medicus Golf, best known for making golf training products such as the dual-hinged shaft, has moved into making the real thing – clubs you can play. After producing some woods, the company this summer introduced the Kick X stainless steel MA-9 tour irons, which are intended for all levels of players. They feature precision heel and toe weighting, creating an expanded sweet spot that the manufacturer says will create greater distance and direction, even if the ball is not hit solidly. The clubs have a tour-forged construction, with an optimal center of gravity and a rear cavity design for balance through the swing. 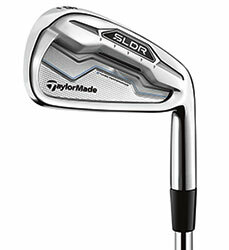 The newest line of TaylorMade irons is the SLDR, released in June. The club has what TaylorMade calls a Speed Pocket, with a slot in the sole designed to produce more face flex in the 3 through 7 irons. The company says the technology produces fast ball speed and high launch across the face for distance and consistency, all while promoting a soft feel. The 8, 9 and wedges have a sole without the speed pocket and are touted for accuracy. Unlike the TaylorMade SpeedBlade irons, the SLDR has only a small offset, with a thin top line and sole favored by many skilled players. But the cavity backs have the forgiveness that average players appreciate. 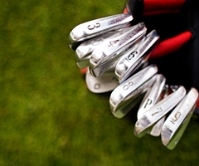 The irons take up the most space in the bag and tend to be the least often replaced as well. Perhaps it’s the investment that gives pause, but with properly fitted irons, the game of golf can be much more enjoyable. Take time to work with a club fitter when trying out these or any other irons. Nearly every player wants to hit the ball farther. It is no secret, that, on average, women tend to hit the ball with less distance than their male counterparts. What then happens is that women are often forced to place an emphasis on their short game and, in fact, often have very strong skills around the greens. However, distance can really help in several situations on the golf course, so rather than give up on hitting the ball farther there are a few simple techniques you can try first. In general, this requires a focus on swing fundamentals to ensure maximum energy is transferred to the ball at impact. Swinging without creating excessive and unnecessary movements will almost always lead to more distance. One sure way to lose distance is to start off with a weak grip. In a weak grip position, a player will only see one (or none) knuckle on the left hand. In addition, you form a “V” between the index finger and thumb on both hands. A neutral or stronger grip will allow you to see at least two knuckles on the left hand while the “V’s” on both hands will point in the same direction toward the right ear or right shoulder. The weak grip will make it extremely difficult to square or close the close the club face through impact. Results will generally be a weak slice. However, a neutral or strong grip will offer the ability to square or close the club face through impact, which should lead to longer and straighter golf shots. Many lateral movements are compounded by standing with a narrow base where your feet are too close together. Set up with the insteps of your feet at about shoulder width apart. The golf swing is a rotational movement that is supported with a wider base. Notice in our photo of the golfer at left. If you were to draw two vertical lines up from the insteps of both feet, those lines would pass straight through the outer part of each shoulder. This wider set up will help support the rotational movement of the swing and cut down on lateral movement. In addition, it will improve stability and balance in your swing. Set up to the ball with the correct posture. Allow your knees to bend slightly and bend at your waist to create your spine angle. The golfer at the right is in a perfect setup position as just described. Once in this position, it is critically important to maintain your spine angle throughout your swing. One of the most common swings faults is where a player stands up from their original spine angle throughout the swing, which incidentally leads to inconsistent shots. Topped golf shots are not the result of picking your head up. Rather, a topped shot usually occurs when a player stands up from their original posture at impact. Stay down, try to maintain your spine angle and swing through for more consistent hits. During the takeaway, stretch your arms away while maintaining your hips and knees in their original position. The idea is to prevent the lower body from over rotating. Since many women are flexible, overturning can potentially destroy the ability to uncoil, thus preventing a powerful downswing. Try to keep the left knee from completely collapsing toward the right knee for more stability and power. As you’ll see with the golfer in our photo, her arms are extended and shoulders fully turned with a lesser turn of the hips and lower body. Her left knee has turned slightly but not fully collapsed to put her in a position to generate a lot of speed and power. She will likely hit the ball with excellent distance assuming solid contact. Try these simple keys and remember to swing within yourself — swinging harder often can compromise solid contact. Hope these tips help. What’s the difference between a picnic and a tailgate party? This question was put to me by Joe Cahn. If you don’t know, and probably you don’t, Cahn is the official Commissioner of Tailgating. Or as he prefers to be called, The Commish. It’s a position he’s held with honor since 1996, when he gave himself the title. Right after selling his cooking school in New Orleans and taking to the open road to promote and partake in what he calls, “the last great neighborhood of the American social.” Or what you and I call tailgate parties. Each year, Cahn says, he visits tailgate parties at 28 professional football games and 14 college games, as well as various other events such as NASCAR races, hockey games, even steeple chase races and polo matches. The Commish estimates that since the mid-1990s he’s logged more than 800,000 miles road-tripping to more than 800 tailgate parties around the country. If anyone knows the difference between a Sunday picnic in the park and a Sunday tailgate party in the parking lot, it’s Cahn. But I’ll have to wait for the answer to his philosophical conundrum. In the middle of our conversation, Cahn is waved over by a fellow highway driver and informed that his grill fell off his vehicle somewhere back down the interstate. Understandably we postpone our call until the following morning so that The Commish can backtrack to rescue his runaway grill. In the time between our calls, I become increasingly intrigued by Cahn’s question about the distinction between picnics and tailgate parties. What at first seems a simple question turns over and over in my mind until it reveals itself to have all the complexity and mystery of a stubborn shoelace knot—not that big of a deal but still something you must solve. Think about it. Picnics and tailgate parties share many similarities. A congregation of friends. Maybe even a few family members you can stand for short periods. Consuming beverages and food, often grilled, in the great outdoors. Playing mildly challenging games to pass the time. The day after losing his grill, Cahn is speaking to me over the telephone from his home in the Dallas-Fort Worth area. When asked about his AWOL grill Cahn sighs, says that’s a long story. And most likely one with a sad ending because he doesn’t tell it. Instead Cahn finally solves the picnic/tailgate riddle for me. So long as you have a common enemy, Cahn says, you have a tailgate party rather than a picnic. But just as there are circles in skee ball and Dante’s Hell, so too are there various levels of intensity in the world of tailgating. NASCAR? Too many adversaries. Your team is just one versus 32 others. Baseball or Hockey? Us vs. Them yes, but diluted with too many games. Golf? No assigned seating. Everyone hustles out of the parking lot and onto the course in a land-grab race to claim their patch of ground as early as possible. Besides, “Get in the hole!” is the most aggressive thing anybody shouts at a golf tournament. Concert? No common enemy so that’s really nothing more than getting lit up in the parking lot before stumbling inside to hear death metal, country, a men’s a cappella chorus or Jimmy Buffet. Based on his not inconsiderable experience, The Commish maintains that the true, concentrated, Us-vs.-Them event is football. That, friends, is the math of a good time. And Kansas City get’s an A+. 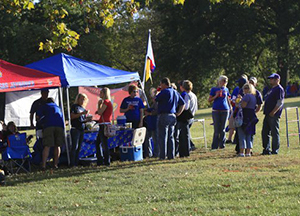 It is The Commish’s judgment that Kansas City (as well as the home towns of Jayhawks, Wildcats and Tigers) is always among the top two or three tailgating experiences in the country. In particular, he says, KC is known for its fantastic array of grills. Okay, you have another team to hate on. But what does it take to make a great tailgate party? 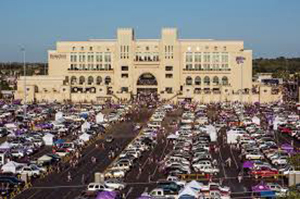 Luckily, like all brilliant ideas, the tailgate party is built on a few basic elements that are scalable to fit a range of attitudes, incomes, races, religions, creeds, colors and parking lot spaces. The party starts in the bedroom. The closet, to be precise. Wear your colors, Cahn says. You’re not going to church. You’re not going to work. It’s a tailgate party, so be sure to show the world what team you live and die by. And if somehow you’ve managed to preserve a pair of those delightfully awful Zubaz pants striped in Chiefs colors, for Nick Lowery’s sake man, break them out! While an adversary is vital to a tailgating, it’s not the most important ingredient of the festivities. Old friends make a good tailgate, as do the new ones you’ll meet as they wander over to your tailgate party. So Cahn says it’s important do as much prep work and pre-cooking ahead of time at home. That way you spend less time at the grill and more time with the people at your party. 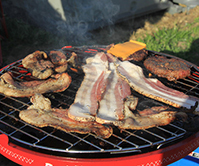 As for what to serve, grilled meats reign supreme at tailgate parties, as they should. But Cahn suggests offering a variety of foods, including healthy alternatives such as power bars and certain functional types of fruits. “You drop a banana or an orange on the pavement, you can still peel it and eat it,” he says. Also, don’t be afraid to be daring with your menu. Keeping it simple by offering finger foods doesn’t have to limit your menu to the bland or the common. A few examples: give a creative twist to your dips (use black beans, crème fraische, etc. ), deviled eggs (infuse the filling with different flavors such as truffle oil or anchovy paste), or bratwurst (simmer in beer, serve with sauerkraut). 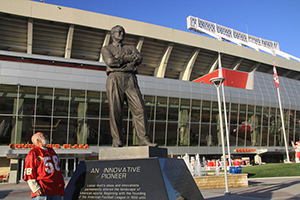 Finally, be sure to bring trash bags and containers for garbage, recyclables and spent coals, though Cahn gives Kansas City points because Arrowhead provides bins for all three. Booze is key, we all know that. Which adult beverages you choose to serve are a matter of taste, style and wallet. Conveniently, the same rules for food also apply to the drinks: keep it simple but don’t be afraid to give them a creative twist. Cahn warns against cross contaminating food and drinks and suggests using separate coolers for each. Also be sure to offer water and soft drinks for any friends of yours who might bring along their children, designated driver or AA sponsor. Okay, back to the booze. If you’re truly serious about your mixology, you might consider investing in a gas-powered blender. You can order one online for $300 plus shipping. Weighing about ten pounds, it’s powered by a 24cc, 2-1/4 horse power Poulan 2-stroke engine with variable RPM, throttle and speed capacity. According to the web site mytailgate.com, the blender’s stainless steel blades are driven by a steel shaft supported with sealed ball bearing construction. It has front-mounted primer, choke and kill switch for easy access. It boasts a 0°-chill in 15 seconds and, with a 60 oz. pitcher capacity, gets about 6,500 MPG (margaritas per gallon). There are varying schools of thought on tailgate party games. Some people are into them, finding them a way to generate fun and conversation, simply passing time until the main event. Others are not into games, and would rather just socialize. Either way, no problem. The problem? There’s always one or two bozos way too into the inane game. Whether it’s a drinking game, a game that involves tossing something across a parking lot without hitting someone in the noggin or even just a raffle, the mixture of aggression, booze and competition always tends to overcome the odd, soft-brained tailgater. Always. So please, for the sake of the grownups who know how to handle their booze, please remember that the game in the parking lot is not the point of it all. The point, of course, is to socialize, and not just with people you already know. Take a little time to stroll around, checking out other tailgate parties, meeting new people, seeing how they instill their creativity into the tailgating experience. 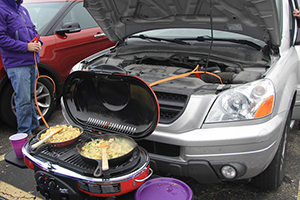 You parking space is the final frontier in your tailgating experience. This is where your tailgate party lifts off or flops. So it’s important to have a focal point of your party space. Or think of it this way: you know how at a house party everyone tends to gather in the kitchen? Same idea, only at a tailgate party it can be the grill. Or a table and lawn chairs. Or just the trunk of your car. Or, big idea person that you are, you can go over the top. Cahn has some incredible stories of spaces he’s witnessed at tailgate parties over the years. Like the gentleman in Oregon with a mobile, stainless steel kitchen on hydraulics that sits at the center of the man’s tailgate party. Then there’s the guy in Minnesota with a step van customized with a living room and working fire place. And Cahn tells of once seeing a landscape dump truck with the bed transformed into a party room including couches and beer kegs. But the dump truck’s true genius? To clean it out, the owner told Cahn, all he had to do was hit a button and the trash just tumbled out. Time to end the fun but some people won’t leave? Same thing, just hit the button. Party’s over, folks. But in all Cahn’s travels, there is one extreme tailgating experience that stands out for him. It is, he says, hands down the most outrageous thing he’s ever seen in a stadium parking lot. The butler proceeds to set up and arrange an elegant table complete with table cloth, candelabra, fine China place settings and so on. For more tailgating tips or to follow the travels of Joe Cahn, the Commissioner of Tailgating, visit www.tailgating.com. There’s still a limestone mine below WinterStone Golf Course in Independence, but there are no more rumbles under the feet of players in mid-afternoon as in years past. Mining has moved to an adjacent site, leaving only occasional faint sounds of blasting, according to WinterStone club professional, Kane Chapman. 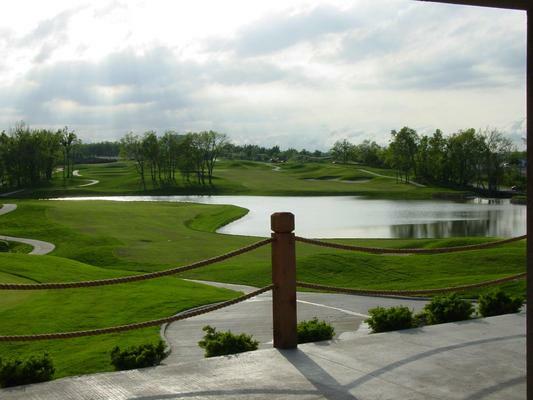 But having a golf course over an active mine was more of a novelty than anything else on a course that can hold its own to any in the Kansas City region for natural beauty, intriguing design and challenging golf. 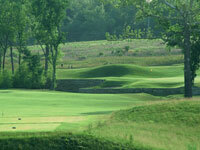 WinterStone, opened in 2003 in northwest Independence and unfolds over rolling, wooded terrain in a country setting. The holes on each nine ascend gradually to a crescendo, before meandering back down to the clubhouse. Designed by noted golf course architect Craig Schreiner, WinterStone has ample landing areas off the tee, but demands accuracy in fairway and approach shots, often from sidehill lies. Creeks and a pair of lakes bring water into play on seven holes, requiring long drives off two of those holes to keep the ball dry. 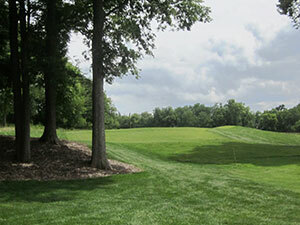 The course has four sets of tees, ranging from 4,976 to 6,752 yards. The lengths can be deceiving, however, as frequent uphill shots require an extra club or two. 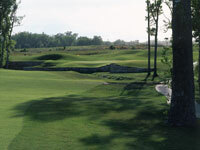 The course carries a 73.6 course rating from the gold tees, or back tees, and a 133 slope rating. Players can count on good lies on the zoysia fairways and true putting on the bent grass greens. The course is noted for its fine condition. Additionally, there are few, if any courses, that have a more convenient practice range than the one found just a few steps from the WinterStone clubhouse. WinterStone has competitive green fees, with twilight discounts after 11 a.m. and 3 p.m. Discounts are also offered seniors, over age 55, and to junior players. Annual fees for play with or without a cart, and reduced for juniors and seniors are also offered. Added to all that, lessons are available from the course’s professional staff. The course also has The Club card, which permits golfers to play WinterStone and five other courses for $34.99 per month plus a $20 daily fee, including cart. 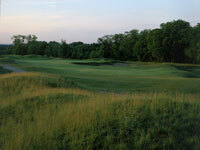 The other courses are Tiffany Greens, Dub’s Dread, Eagles Landing, Deer Creek and Alvamar. Tee times can be made up to four days in advance. 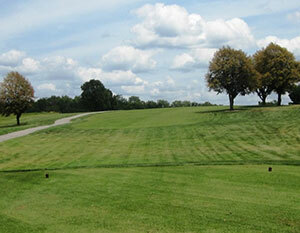 WinterStone is the place to turn to for corporate, charitable and other tournaments and special events. 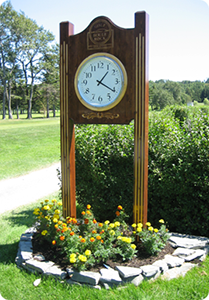 The course will provide a tournament price that includes golf, carts, scoring, rules of play, sponsor placement signs on holes, and awards ceremonies. The Pavilion, a snack bar and lounge with table seating for 120 next to the clubhouse, will post digital scoring on flat screens for tournaments and host awards ceremonies and meals before or after the event. With an elevated and picturesque view of the golf course, the Pavilion is the perfect place to spend a little “debrief time” following your round. It can also be rented for wedding receptions and other events, with room for up to 150 people. Surrounded by windows, The Pavilion can be used open-air or enclosed for climate control. WinterStone is located at 17101 E. Kentucky Road just east of Highway 219. 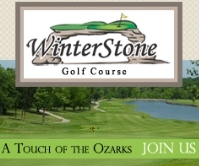 Its website is winterstonegolf.com and the phone number is 816-257-5755. Have you ever wondered how a golf professional prepares for a round? Before a competitive round a golf professional normally arrives at the course hours before their tee time. They begin with stretches to loosen their body up and move to the practice green. Professional’s focus on other short game areas such as chips, pitches and bunker shots. Next, they work on their full swing at the practice range. Typically, they spend a few more minutes on the putting green before they head to the first tee. There is no doubt they are fully prepared physically and mentally for their upcoming round. I routinely witness amateur players arrive at the golf course with only a few minutes to spare. They spend little or no time warming up and the first few holes result in bogeys or worse. While you don’t need to go through an in depth routine such as a tour professional, however, you will benefit by spending a few minutes warming up before your round. Try to arrive early and develop a consistent routine before every round. Stretching is an important aspect to prepare your body for the upcoming movements and prevent injury. Static stretching is regularly used to improve flexibility. However, static stretching does little to contract the muscles needed to generate powerful golf swings. An example of a static stretch is touching your toes. Dynamic stretches help improve range of motion while reducing muscle stiffness. In fact, a recent article in the Journal of Strength and Conditioning Research concluded that a dynamic warm up routine increased strength and flexibility whereas a warm up with static stretching did not show any positive changes in muscle flexibility or strength. Many athletes prefer dynamic stretches during their warm up routine. An example of a dynamic stretch is arm swings. After your muscles are properly warmed up continue your warm up routine. Try to follow a program where you start with smaller swings and move to bigger swings. This helps prevent the potential for injury. 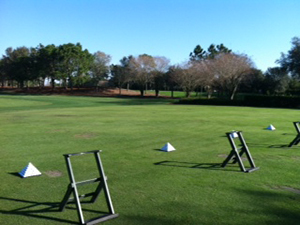 Therefore, begin with some practice on the putting green, developing a feel for the speed of the greens. After a few minutes of putting, hit a few chips and pitches. 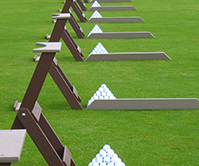 Finally, make your way to the practice range and begin with wedges while eventually moving up toward a driver. This progression will prepare you for the round and also help keep you injury free. There is a reason why tour professionals do not begin their warm up routine by ripping drivers. Unfortunately, there are times when you can not arrive thirty minutes or more before your tee time. If you only have a few minutes, use the time wisely and stretch out with a few dynamic movements. Next, spend a few minutes rolling a few putts or hitting a few chips and pitches. 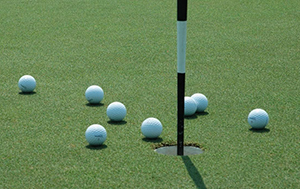 The short game will determine how well you score throughout the round.